Life is full of meaningful moments, moments when you connect with others and achieve your personal and professional goals. Between those moments, the rest of life happens: the commute, the checkout line, the small talk about celebrities or sports, and the other trivial things that rush in to fill time that you don’t fill yourself. If you’ve been feeling insignificant, under-appreciated, or stressed, your priorities may be out of balance. For years, the FranklinPlanner system has promoted the Time Matrix chart, a construction that lets you divide your daily tasks and actions based on urgency and importance. 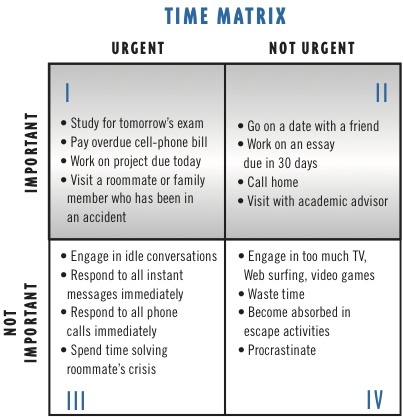 Quadrant I is where Important and Urgent tasks intersect. The more time you spend on these tasks, the higher your stress level. Quadrant II is where the meaningful moments reside. Your most important and productive actions happen when you stay ahead of deadlines and focus on what matters most. Quadrant III combines the constant pressure with little importance, for a truly frustrating experience. People who spend a lot of time in Quadrants I and III often end up spending the rest in Quadrant IV, trying to ease the burnout with entertainment while passing the time until the next deadline. So how can changing your plans help you get into the sweet spot of completing your important tasks before urgency strikes? Consider a weekly planning session before your week starts. Review your top priorities, such as upcoming work projects and events in your personal life. Visualize how you’d like each to play out, and then write the corresponding tasks on each day in your planner. Inevitably, some work projects, emails, and meetings will be urgent and out of your control. But you can plan ahead on the projects you control directly, spreading them out and delegating as needed before they become urgent. Then when the fires crop up, putting them out won’t push your normal work into your personal time. Sometimes, adjusting your life means deciding on whether something is truly important to you, or whether you’re trying to live up to someone else’s expectations. As you evaluate each task, ask yourself which priority it fulfills for you, or for those around you. Completing tasks for the sole reason of pleasing others tends to be unfulfilling. When you plan your important tasks first, you end up with the satisfaction of completing them. I have adjusted my work and home schedule to increase my study time. As of today it has not worked out, because of the past snow storm. I had to stay at work for 24 hours, and I have worked 6 days in a row . I\’m happy to say everything is back to normal. I can plan my schedule for the week so I won\’t end up stressing and struggling to complete my assignments. In planning my schedule set so many hours to study and time to complete all assignments. I will not complete task so it will be pleasing for others. The task that I do will be for me. I love the part about \”completing certain task for the sole reason of pleasing others.\” I tend to struggle with this as it relates to non-family members. My goal is to correct it immediately! I will also work to not engage in meaningless conversations. I have so many things that need to be done. I need to prioritize my work. This may free up wasted time that I am constantly using. Planning ahead of time, the beginning of the week setting top priority tasks up to succeed and manage. I plan my schedule to complete my assignments then unplanned tasks I did not anticipate arises and takes my time away. I try to schedule time a block at a time, and with distractions I have to reschedule. I am dealing with the limited time I have and sometime I do things unscheduled just to readjust from the scheduled time that I could not use. I need to get a handle on my time, prioritizing the way my life NEEDS to work. I need to make sure I organize my work over my outside work fun. Planning ahead and being organized appears to be important factors to a happy and successful life. Planning ahead ahead of Time and setting goals make your daily life much easier. I try to not engage into idle conversations because it slows me down from what needs to get accomplished. My life is very busy and even though I do like to communicate with people and have fun, I try to priorities what is more important. I normally plan everything way in advance, which I normally keep a monthly calender and I try on taking care of the matter prior to the date of the actual event. Thats one thing that the military showed me and thats time management and prioritizing. I like to drift cars and put my plans in a planner. I plan out my schedule within a week ..i mostly leave to weekend to relax or catchup on certain family issues/ personal life. I do need to get a little better with time management and procrastination throughout the week. I have never planned out my daily schedule, this will all be new to me, I’m looking forward to not stressing over time. I plan to start scheduling my weeks out for better time management. I have a planner that I record important dates and events in so I don’t forget. I never keep up with the amount of time it takes to finish or complete activities on my list, but keeping a time management sheet would definitely help allocate time to other areas of interest or need. I have never scheduled my week. I have always just done things through out the day and hope to get everything done in time before I go to sleep. But I might have to start scheduling my week. I’m learning that I need a planner and a weekly plan to stay on schedule. I will dedicate my time more appropriately, giving myself the amount of time for each class. I have constructed a plan where in the mornings I do as much as I can as far as my schooling. I make sure my phone is not interfering and my other priorities are already token care of. Then I stop at a certain time and focus on the other areas, then return to my remedial tasks a hand. So far this has proven quite effective. I’m usually on point with time management and prioritizing. This tool will help to enhance my list of prioritizes. it’s so much easier having your week planned out versus going day by day. Although being in the military it’s hard to plan out a week’s work without something changing. So using my time wisely has been a key factor for my success. I have never thought of scheduling my daily activities but this is something that will give a try. Hopefully it will make the week go by more smoothly. i actually keep a budget planner and also a monthly/weekly calendar/scheduler and I use it faithfully! I even went ahead and bought these really cool budget books and calendar books that have stickers and cute little post it packs to make my scheduling almost like scrapbooking. It is alot of fun to get into my calendar and write things in, and the same goes for the budgeting! I actually look forward to digging into that schedule!